Allergy Releaf® System Advanced, synergistic nutritional and herbal formulas deliver essential benefits and ongoing soothing comfort. 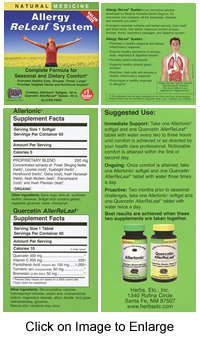 Maintains a healthy response in the respiratory and digestive system. Promotes healthy eye, sinus, throat, lung, adrenal, skin and gastrointestinal tissues. Stabilizes mast cells and promotes a healthy response. 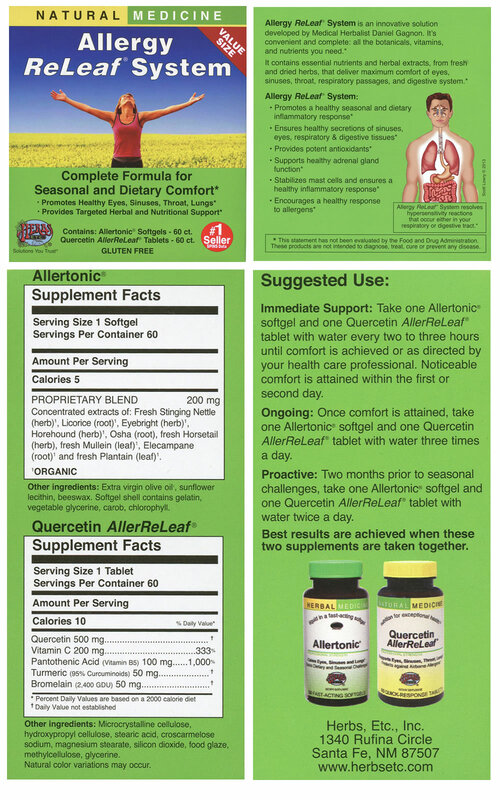 Each Allergy ReLeaf® System contains Allertonic® and Quercetin AllerReLeaf® . Ingredients: Allertonic® contains: Fresh Stinging Nettle herb, Licorice root, Eyebright herb, Horehound herb, Osha root, fresh Horsetail herb, fresh Mullein leaf, Elecampane root, and fresh Plantain leaf. Suggested Use: Immediate Support: Take one Allertonic® softgel and one Quercetin AllerReleaf® tablet with water every two to three hours until comfort is achieved or as directed by your health care professional. Noticeable comfort is attained within the first or second day. Switch to Ongoing use. Ongoing: Take one Allertonic® softgel and one Quercetin AllerReLeaf® tablet with water three times a day. Proactive: Two months prior take one Allertonic® softgel and one Quercetin AllerReLeaf® tablet with water twice a day. Best results are achieved when these two supplements are taken together. I have been using these herbs for over a year. I have been using these herbs for over a year. If taken consistently, they are helpful in controlling my pollen and environmental sensitivities. Nothing worked completely until I tried Allergy Releaf! Amazing results for me. It worked best taking it every 3-4 hours for a few days, but now a maintenance dose 2-3 times a day is sufficient. And no side effects! Thanks for this wonderful product! I recently moved to the middle of TN. I was referred to Allergy ReLeaf System. I started with 1 pill of each and never had to increase the amount of dosage. Even when traveling, I take Allergy ReLeaf and never have discomfort. This product is very effective. It has been a true blessing and I recommend it to everyone I know with similar needs. II tried many products to find relief. Thank goodness I found this one. It worked right away following the protocol on the bottle. I won't use anything else since it worked so well. This is the first review I have written for ANY product! I tell everyone about how well it worked for me and hopefully it will help many more allergy sufferers. I have got to say, I have tried everything in the market. I have been on AllerReleaf for about a month. This company has been a god sent for me. Thank you so much, and I had been referred through a complete stranger. I thank her for telling me about AllerReleaf. I picked up the Allergy ReLeaf system on a visit to Asheville from the southwest Virginia area. Now, a month later, I only have to take this product once a day to maintain easy breathing. I swear by this and would recommend this to anyone looking for relief.